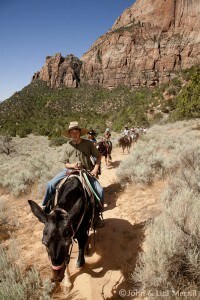 Your horseback excursion through beautiful Zion National Park will be the highlight of your vacation experience. From the time you mount up until our first rest stop, scenes and natural wonders will open to you at every turn. You’ll see such natural wonders as the Three Patriarchs, the Beehives, and take a breathtaking jaunt through beautiful cactus gardens. 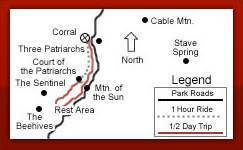 For a nice relaxing horseback tour, the 1 hour ride will follow the Virgin River for about one mile to the Court of the Patriarchs and return you back to the loading corral. 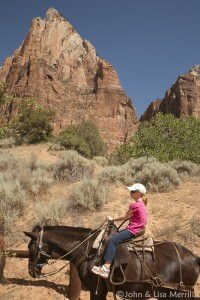 For a more adventurous horseback ride the three hour trip will take you around the Sandbench Trail, gradually ascending 500 feet giving you a spectacular view of the Southern end of Zion National Park. 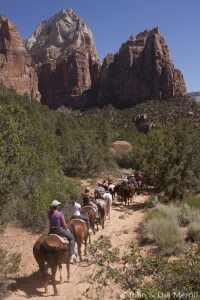 Zion Canyon National Park rides can be booked from March – October. 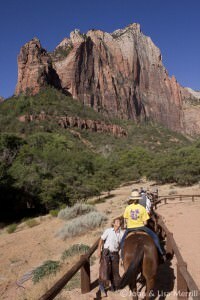 These rides take place in Zion National Park. Reservations for 2019 can be made after January 1st.